In her follow-up to the wonderful Catching Jordan, Miranda Kenneally has established herself as a masterful writer of young adult contemporary fiction. 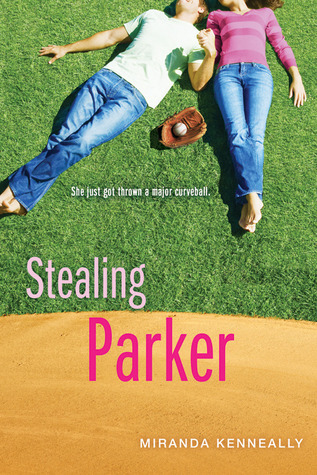 Like her first book, Stealing Parker follows a normal teenage girl going through unusual but believable trials, shows her progress into a wiser, better person, and pairs her up with a great guy. Parker's world fell apart when her mother left the family for another woman. Not only does Parker have to deal with the normal anger and grief that anyone would experience when a parent leaves, but she also has to deal with the aftermath of her mother's scandal. Parker's unforgiving, conservative Christian neighbors only make things worse by acting like she's tainted. Parker's personality transplant into feminine, flirty make-out queen is understandable in the circumstances. The first guy on the scene in this book is Brian, the boy's baseball coach. Since he's the only guy mentioned in the synopsis, I wondered if he would be the "hero" of the novel. He starts out being good for Parker. He jokes around a lot and treats her differently than her peers. But eventually the creepiness factor slithers in. Brian is not a bad guy per se. If Parker was a few years older, they might make a good pair. But this is lesson number one in why 18 + 23 = Bad Idea. Enter up Will. Sweet, smart, funny, down to earth. He's there for Parker when no one else is and doesn't judge. What I love about Ms. Kenneally's books is that the winning guy is not necessarily swoon-worthy, drop-dead gorgeous. Or even if he is, that's not what's emphasized. The main characters of the Hundred Oaks series find nice guys. These are the types of guys who, even if they don't end up getting married some day, the girls can look back at their relationship fondly, instead of wondering "ugh, what was I thinking?" Plus, the boys are "boys," not unrealistically mature men in 18 year old bodies. If you're a fan of contemporary YA fiction, I can't recommend Stealing Parker or Miranda Kenneally's other books highly enough. There's lots of snark and witty dialogue to make you laugh. The main characters end up in better places than they started and they find super sweet guys. These are the kinds of books that make you go "Awww..." at the end. I still need to read Catching Jordan and judging by this book I must get to it soon. I can't wait to meet the characters. Lovely review! I haven't read any of Miranda Kenneally's books myself yet, but I totally dig that the love interest is always a nice guy. I approve! Well, this sounds great. Thanks for the review, Alison - you totally make me want to read these books! OoOo I LOVE these books and ... your last comment made me smile so wide" These are the kinds of books that make you go "Awww..." at the end. " Do you have to read the first one to read the second? I like the sound of Stealing Parker. Oh, Parker. Those older guys *seem* like a good idea but when you're still a teen, they're really not. Always better to look and NOT touch... Though it's tempting. I'm loving Kenneally's contemporaries! They're so cute and sweet and fun. "What I love about Ms. Kenneally's books is that the winning guy is not necessarily swoon-worthy, drop-dead gorgeous. Or even if he is, that's not what's emphasized." YES! I really love that about her books as well Alison. There's such a nice realism to them, and that never fails to draw me in:) I have the next book on my list for next week and I can't wait to see what Matt is like! On a random side note, we got the same spam comment today. *high five* I've been getting spammed non stop lately! I have not read this series but mean to. I love contemporary YA, especially books that make you happy at the end. Great review! I liked this one too. I wasn't really sure where the romance was going either and enjoyed watching it play out. I didn't like it as much at Catching Jordan but I still liked it a lot! I'm glad to hear this was a good follow up to Catching Jordan. I downloaded it a while ago but still haven't read it. The next ones coming out soon so I need to get reading! I read this one first and I had to immediately get Catching Jordan but,I haven't read it yet. I loved this one and it took me completely off guard because I didn't expect to love it so much because I am not a huge contemporary fan. This one is my TBR pile. I also picked up Catching Jordan. I really do need to get to these. Ahhh Miranda's books are THE BEST. I seriously love her guys. They are so sweet and hot, yet also like REAL guys. I adored Will. :) What a cutie pie!